Background: Despite increasing success rates, dental implants remain susceptible to multiple inflammatory and noninflammatory complications. Given the increased usage of dental implants in Saudi Arabia, it is reasonable to assume that a general practitioner (GP) will come across a case of peri-implantitis in his/her routine practice. Aim of the Study: The primary aim of this study is to assess the knowledge and awareness of general dental practitioners in Riyadh, using a radiographic- and clinical visual-based questionnaire in the management of implant complications. Materials and Methods: The study was conducted using a Google form questionnaire that was distributed to the GP database of the Saudi Dental Society. The questionnaire comprised of three parts. The first part of the questionnaire included the demographic data of the respondents, the second part contained visual radiographic and clinical pictures that were aimed to assess the knowledge and awareness of the participants toward the commonly occurring peri-implant complications and their management, the third part tested the attitudes of the participants toward the management of these complications. Statistical Analysis: The frequencies of the submitted data were measured using the mode and median for the nominal and ordinal variables, respectively. The Chi-square test was used to test the significance of differences while a logistic regression model was developed to assess the impact of variables such as age, year of graduation, and the extent of knowledge. Statistical analyses were done using SPSS V.22. Results: Two hundred and four responses were collected, 190 (93.1%) consented on participating in the study. The majority of the respondents were graduates before the year 2012 (47.5%). Most of the respondents (71.6%) had received a dental implantology didactic course during their undergraduate studies. There was no significant difference in the answers of the dentists who were given didactic courses in their undergraduate studies or not (P > 0.05). Most of the participants were able to identify problems related to the anatomical structures and implant-supported prosthesis, but not the surgical components of the implant itself. Conclusion: Dentists who participated in dental implantology workshops had a higher tendency to answer correctly compared to dentists who were given didactic courses in their undergraduate studies in issues associated with hands-on training. This shows that hands-on training in the undergraduate studies would result in a better understanding of dental implants, its complications, and management. Dental implants have become a critical part of the 21st century dental practice. The role of dental implants in the prosthodontic rehabilitation of patients has been extensively studied with trends suggesting that greater number of patients would prefer to pay for dental implants. This trend has also been evidenced by the change in the reasons for patients choosing to extract teeth. Saudi Arabia has a documented prevalence of high tooth loss due to dental caries. Over the past decade, there has been an increased acceptance of dental implants among Saudi patients., While patients are willing to pay for dental implants, little is known about how prepared general dentists in Saudi Arabia are to treat, manage, and maintain dental implants in their practice. A recent British study found that general dentists in the United Kingdom were underprepared to deal with the complications of dental treatment. Similar data are however unavailable in Saudi Arabia. The use of photographic diagnostic questions as a method to test a dentist's ability to diagnose and manage a clinical situation related to implants is well established. The aim of the current study was to use a photograph-based questionnaire to evaluate the ability of general dental practitioners in Riyadh, Saudi Arabia, to diagnose and suggest potential management solutions for complications arising from the placement of dental implants. There have been several studies that have raised the issue of insufficient dental implant education at the undergraduate level.,,, Given this background, the study also sought to determine the educational factors that affected their ability to diagnose and manage the above-mentioned complications. A questionnaire was developed based on the works of previous researchers,,, and comprised of three parts. The first part of the questionnaire included the demographic data of the respondent. The second part of the questionnaire contained visuals, radiographs, and clinical pictures that were aimed to assess the knowledge and awareness of the participants toward the commonly occurring peri-implant complications and their management. The third part tested the attitudes of the participants toward the management of these complications and aimed to assess the actions of the respondents. The validity of the content of the questionnaire was measured by testing the responses of experienced implantologists against the ideal responses provided. The experienced respondents were able to answer all questions correctly, suggesting that the questionnaire had valid and clear content. Reliability of the questionnaire was tested by distributing twenty pilot questionnaires to newly graduated dentists who filled the same form after a period of 3 weeks. The Cronbach's alpha was found to be 0.781 which is good for a new questionnaire. An online questionnaire form was developed and distributed to the general dental practitioners in Riyadh, Saudi Arabia. The questionnaires were distributed electronically using Google forms through the Saudi Dental Society database of GPs. The frequencies of the submitted data were measured using the mode and median for the nominal and ordinal variables, respectively. The total knowledge score was calculated by summing up the knowledge questions, while the total attitude score was calculated by summing up the answers on the attitude questions. The one-way ANOVA test was used to test the significance of differences while a linear regression model was developed to assess the impact of variables such as age, year of graduation, and the extent of knowledge. Statistical analyses were done using SPSS V.25 (IBM Corp. Armonk, NY, USA). Out of 204 responses collected, 190 (93.1%) consented on participating in the questionnaire. Out of the 190 responses, 53.7% were males and 46.3% were females. The majority of the responses were graduates before the year 2012 (47.5%). 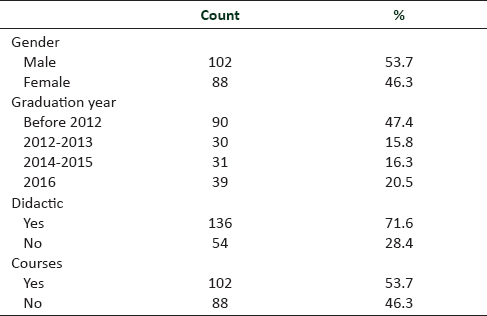 Most of the respondents (71.6%) had received a dental implantology didactic course during their undergraduate studies and 53.7% reported that they had participated in extracurricular dental implantology workshops [Table 1]. There was no significant difference in the answers of the dentists who were given didactic courses in their undergraduate studies and those who were not given (P > 0.05). Most of the participants were able to identify problems related to the anatomical structures, “for example, compression of the inferior alveolar canal” and implant-supported prosthesis, “for example, improper prosthesis design and gap between the abutments and fixed dental prosthesis,” but not the dental implant itself. While participants who have participated in dental implantology workshops had a better understanding of the inflammatory reactions of dental implants, “for example, peri-implantitis” and the surgical components of the dental implant, “for example, loose cover screw and improperly seated healing abutments.” Participants with more years of clinical experience, who have graduated before 2012, had a higher tendency to answer the questions correctly [Table 2]. When the attitude of the dentists toward the management of the problem was assessed, dentists who had attended further education courses were significantly more likely to attempt to manage the problem than those who had not attended such courses. Whether or not a dentist had received a didactic course in implantology at the undergraduate level did not significantly affect the attitude of the dentists toward management of the problem. The time since graduation also influenced the attitude of the dentist, with dentists who had more clinical practice, being more likely to try to manage the situation [Table 3]. 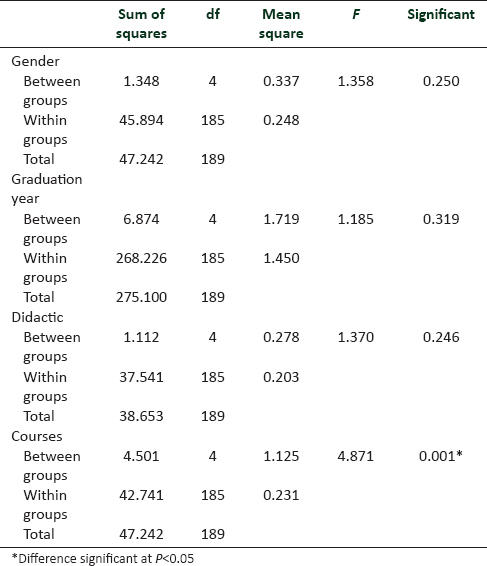 When linear regression models were developed for both knowledge and attitude, it was noticed that the year of graduation, undergraduate dental education, and the attendance of courses after graduation had a significant positive correlation with knowledge, but the only factor that significantly influenced the attitude of the dentist toward the problem was whether or not they had attended a continuing education course after their graduation [Table 4] and [Table 5]. The placement of dental implants is today a necessary part of a modern dental practice. Whether dentists choose to place the implant themselves or call in a specialist for the placement of the implant, the long-term follow-up of the patient falls to the GP., The aim of this study was to assess if general dental practitioners in Riyadh city were able to diagnose and willing to manage patients with dental implant complications. The role of dental education and modern dental curricula in providing dental implant education has been extensively studied.,, It is a common belief that there is insufficient education regarding dental implants for undergraduate practitioners. The results of our study are somewhat ambiguous in this matter. While the fact that theoretical courses improved the ability of the dentist to diagnose implant complications was documented in the study, what was surprising was that this factor had no bearing on the overall attitude of the dentist toward the treatment of the patients. One possible explanation for this finding could be the fact that most dental schools in Saudi Arabia offer implantology as a didactic component of the undergraduate curriculum, but do not stress on the clinical aspects of the course. This is in keeping with the findings of Pineda et al. who recently showed that the environment (clinical or didactic) in which the student is trained significantly alters his/her perception of clinical situation. The role of continuous professional development has also been highlighted as a means to improve the overall skills of general dental practitioners toward dental implants., The results of this study show that regardless of didactic training, the single most important factor influencing the attitude of the practitioners toward dental implants was whether or not they sought continuing dental education on the topic. The adverse role of several short “implant courses” that seek to train GPs in the placement of dental implants has been documented. However, perhaps, there is a need to stress that training the GP, the management of implant complications, and the long-term maintenance of the implant are as critical as the placement of the implant. The results of this study have to be viewed in light of certain limitations. The fact that the study used a new questionnaire and the fact that the majority of the practitioners surveyed were young dentists with <5 years of experience must be kept in mind while interpreting the results. Within the limitations of this study, we can conclude that although the general dental practitioners surveyed in this study had some knowledge regarding the diagnosis of dental implant complications, they lack the confidence and/or the will to manage them. There is a need to increase the awareness of general dental practitioners in Riyadh City regarding the diagnosis and management of the complications of implant treatment. In conclusion, dentists who have taken didactic courses answered the questions related to anatomical structures and implant-supported prosthesis correctly, while they had little knowledge about the implant components and radiographic interpretation of complications related to the dental implant itself. On the other hand dentists who participated in dental implantology workshops had a higher tendency to answer correctly in issues associated with hands on training. This shows that hands on training in the undergraduate studies would result in a better understanding of dental implants, its complications, and management and provide better care for patients. The authors are grateful to Dr. Mansour K. Assery for his help in the design of the diagnostic instrument used in this study. Greenberg AM. Dental implants and evolving discipline. Oral Maxillofac Surg Clin North Am 2015;27:ix-x. Vere JW, Eliyas S, Wragg PF. Attitudes of general dental practitioners to the maintenance of Locator retained implant overdentures. Br Dent J 2014;216:E5. Jackson TH, Guez C, Lin FC, Proffit WR, Ko CC. Extraction frequencies at a university orthodontic clinic in the 21st century: Demographic and diagnostic factors affecting the likelihood of extraction. Am J Orthod Dentofacial Orthop 2017;151:456-62. Jayachandran S, Bhandal BS, Hill KB, Walmsley AD. Maintaining dental implants – Do general dental practitioners have the necessary knowledge? Br Dent J 2015;219:25-8. Palatta A, Cook BJ, Anderson EL, Valachovic RW. 20 years beyond the crossroads: The path to interprofessional education at U.S. Dental schools. J Dent Educ 2015;79:982-96. Clark S. Professional attitudes to specialisation and minor oral surgery in general dental practice. Br Dent J 1995;179:209-13. Stanford CM. Application of oral implants to the general dental practice. J Am Dent Assoc 2005;136:1092-100. Huraib SB, Nahas NA, Al-Balbeesi HO, Abu-Aljadayl FM, Vellappally S, Sukumaran A, et al. Patient preferences in selecting a dentist: Survey results from the urban population of Riyadh, Saudi Arabia. J Contemp Dent Pract 2015;16:201-4. Kontra C, Lyons DJ, Fischer SM, Beilock SL. Physical experience enhances science learning. Psychol Sci 2015;26:737-49. Chaudhary S, Gowda TM, Kumar TA, Mehta DS. Knowledge, attitudes, and perceptions of undergraduate dental students toward dental implants – An all India survey. Implant Dent 2015;24:160-5. Heasman PA, Witter J, Preshaw PM. Periodontology in the undergraduate curriculum in UK dental schools. Br Dent J 2015;219:29-33. Pineda K, Bueno R, Alvarado C, Abella F, Roig M, Duran-Sindreu F, et al. Influence of academic training in endodontics and implantology on decision-making in undergraduate students. Aust Endod J 2017. Mattheos N, Janda MS. Exotic encounters with dental implants: Managing complications with unidentified systems. Aust Dent J 2012;57:236-42. Gallagher J, Blackburn TK, Hutchison I, Magennis P. Governance, guidelines, audit, and revalidation in the 21st century. Br J Oral Maxillofac Surg 2015;53:409-11. Vohra F, Shah AH, Zafar MS, Kola Z. Knowledge and practice of implant-retained restorations among dental students in Saudi Arabia. Pak J Med Sci 2015;31:848-53. Carrilho E, Dianiskova S, Guncu GN, Karakoca Nemli S, Melo P, Yamalik N, et al. Practical implementation of evidence-based dentistry into daily dental practice through a short time dependent searching method. J Evid Based Dent Pract 2016;16:7-18. Murray CM, Thomson WM, Leichter JW. Dental implant use in New Zealand: A 10-year update. N Z Dent J 2016;112:49-54. Yilmaz Z, Ucer C, Scher E, Suzuki J, Renton T. A survey of the opinion and experience of UK dentists: Part 1: The incidence and cause of iatrogenic trigeminal nerve injuries related to dental implant surgery. Implant Dent 2016;25:638-45.